Like New, One Owner, 2016 Civic EX***Sunroof, Backup/Sideview Cam, Remote Start*** Only 23k Miles! 2016 Honda Civic EX w/ Rear & Side Cameras,Sunroof, 23k Miles! Trim:EX w/ Rear & Side Cameras,Sunroof, 23k Miles! Like New, One Owner, 2016 Honda Civic EX, POWER SUNROOF, SIDE & REAR VIEW CAMERAS, Only 23k Miles, CARFAX/AUTOCHECK and STATE CERTIFIED with BUYBACK GUARANTEE, Automatic, Loaded w/Power Options, STEERING AUDIO CONTROLS. 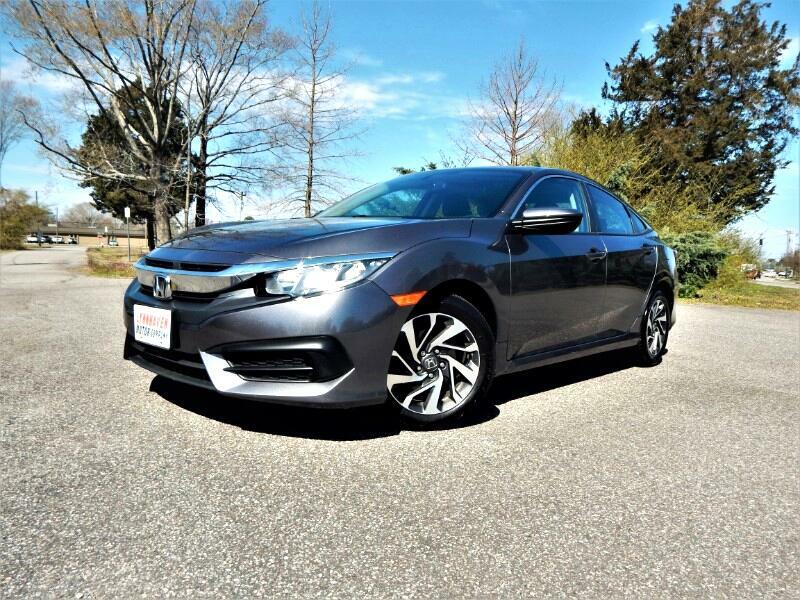 MP3 SATELLITE RADIO COMPATIBLE, Alloy Wheels, STILL UNDER FULLY TRANSFERABLE FACTORY WARRANTY, KEYLESS ENTRY, REMOTE START...The 2016 Honda Civic is fully redesigned. This new Civic has daring looks, turbocharged power and a spacious, technology-rich interior for you and your friends or even a few kids. Like the best Civics of yore, the new one feels sporty and fun when you're driving it on winding back roads. Unlike its predecessors, however, it's fairly quiet inside at speed, and its ride is more compliant than ever. The 2016 Honda Civic has a sharpness on the road that's been absent in recent years. Steering response is lively, and there's notably less body roll than in the previous Civic. It comes standard with stability control, antilock disc brakes (many previous Civics came with rear drums), front side airbags, side curtain airbags and a rearview camera. You might think of this Civic as a small, relatively inexpensive car for buyers on a budget, but this gorgeous machine is so much more than that. As with any other of our vehicles, you may have this one pre-inspected by your trusted mechanic prior to purchase. We strive to only keep high quality vehicles with low mileage offered at the most competitive price. We are a family run independent Dealership with over 30 years of experience serving families, and our low overhead translates to lower prices for our customers. Each of our pre-owned certified vehicles goes through a 108 point check and Virginia residents receive a brand new State Inspection. Visit us online at www.lynnhavenmotors.com to see more pictures of this vehicle, or call us at 757-425-9300 today to schedule your test drive. Vehicle Inquiry for 2016 Honda Civic EX w/ Rear & Side Cameras,Sunroof, 23k Miles! Trim: EX w/ Rear & Side Cameras,Sunroof, 23k Miles!